Pack includes Les Paul Special-II LE, 15watt amp with reverb, tuner, comprehensive lessons from eMedia™ and more! Epiphone’s Les Paul Performance Pack has everything you need to take on guitar in a serious way, including a genuine Les Paul Special-II LE electric guitar featuring two classic humbucker pickups and a full-on 15watt Epiphone Electar guitar amp with reverb. 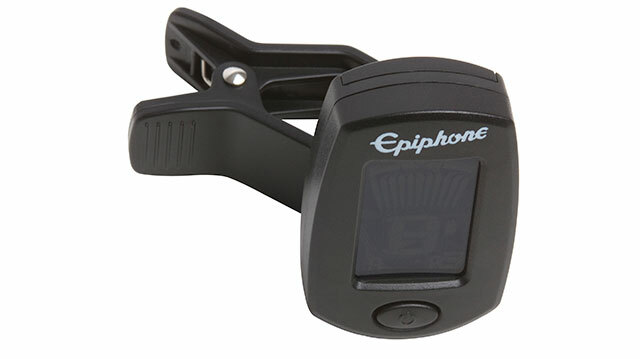 Epiphone also includes a guitar cable, a clip-on headstock chromatic tuner, an Epiphone guitar strap, medium picks, and an easy-to-carry gigbag. And best of all for new players, the Les Paul Performance Pack comes with free downloadable guitar lessons from eMedia. eMedia’s introductory guitar lessons offer easy instructional videos covering rock, blues, folk, country, hard rock, metal, and everything in-between. For 140 years, Epiphone has been a leader in creating innovative guitar designs and crafting fine instruments that anyone can afford. You’ve always wanted to play guitar—and now Epiphone has made it easy. Make your own history today with the Les Paul Performance Pack. The Les Paul Special-II LE is renown for its monstrous tone thanks to two open-coil humbuckers and a solid wood body with the classic Les Paul Special profile. Together, they produce that one-of-a-kind Les Paul roar. Unlike single coil pickups that are sensitive to interference from all other electrical sources, Epiphone humbucker pickups “buck the hum,” giving you buzz-free tone that can go from clean to overdrive without the extra noise. The Les Paul Special-II LE’s solid bolt-on hard maple neck has a classic rosewood fingerboard with dot inlays. The iconic Epiphone “clipped dovewing” headstock features precision 14:1 ratio machine heads and the iconic signature of the man himself, Les Paul. Only real Les Pauls have Les’ classic signature on the headstock. Accept no substitutes. 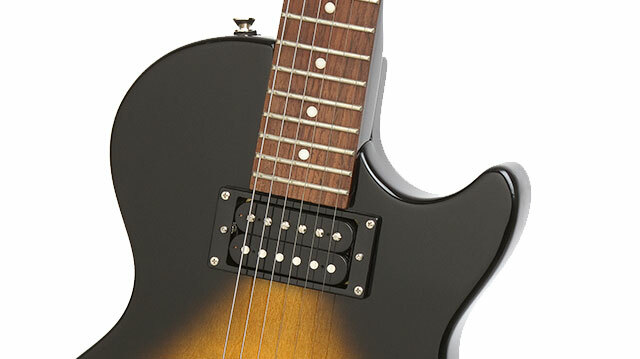 The Les Paul Special-II LE comes in two classic color finishes, Ebony and Vintage Sunburst. The Les Paul Performance Pack also includes a portable Epiphone Electar 15-watt amp with reverb. Low watt guitar amps are popular for beginners and pros alike for their ‘just right,’ easy-to-find tone that sounds full and strong even at low volume. In fact, many pros prefer 15watt amps in the studio. They’re perfect for recording, small clubs, or just playing around the house. 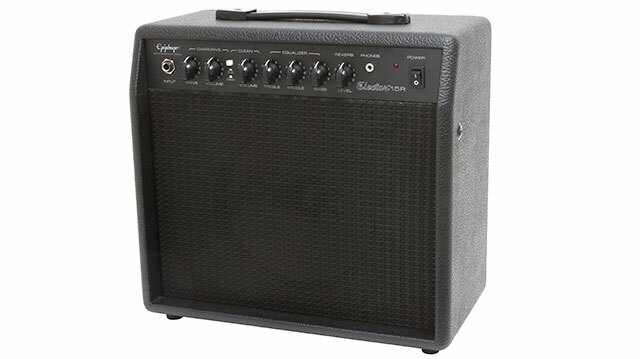 The Epiphone Electar 15-watt amp features a classic open-back cabinet and two unique channels, Overdrive and Clean. The Electar’s Overdrive and Clean channels are controlled by an easy-to-use Channel Selector Button on the front of the amp. The Overdrive channel has both Volume and Drive controls. You’ll fine every era of classic rock distortion and crunch with easy adjustments. The higher you go, the harder the sound. The Clean channel gives you distortion-free gain. In fact, you’ll find much more “clean” volume than you would think possible from an amp this size! Use the Les Paul Special-II LE’s volume and tone controls in combination with the Electar’s Overdrive and Clean channels to find your sound. Then, make fine adjustments with the Electar’s Equalizer section featuring Treble, Middle, and Bass controls. Now, add the Electar’s Reverb control and you’ll easily find the classic, blues, metal, and hard rock riffs you love. The Epiphone Les Paul Performance Pack includes a clip-on headstock Epiphone chromatic tuner, making it easy to make fine tuning adjustments on stage or in the studio. The Epiphone chromatic tuner is fully adjustable and features an easy to read display. And for new players, eMedia’s introductory guitar lessons offer easy instructional videos that expand to full-screen. The eMedia software includes powerful, new interactive feedback on melodies and a full complement of helpful tools such as the new Note Tracker and Finger Tracker, which show you what you’re playing in staff notation and also on an animated fretboard. This amazing technology tracks your progress through the song as you play! Songs and exercises can be heard either as live recorded audio or as MIDI tracks that you can slow down or speed up. 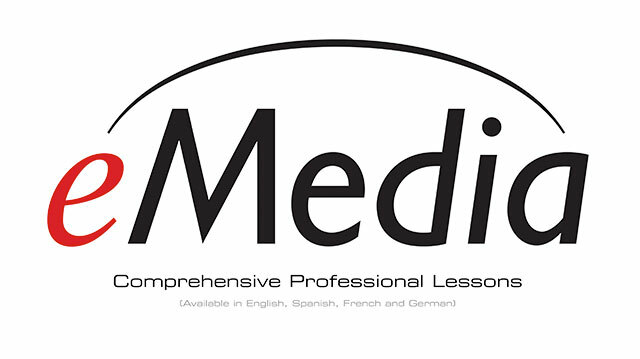 And, eMedia guitar lessons can be upgraded and are available in English, French, Spanish and German.